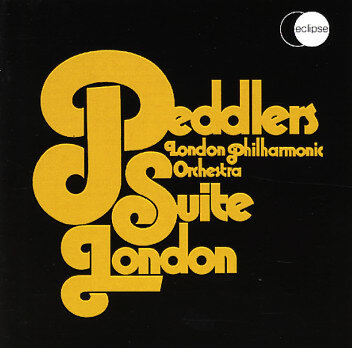 A really fantastic final album from The Peddlers – the UK trio who effortlessly mixed jazz and soul in the 60s, but who work here in a more expanded format! All the best elements of the group's sound are still nicely in place – those raspy vocals, strong use of keyboards, and especially their great sense of a groove – one that's made them a favorite for samples for more sophisticated DJs and producers over the years! But here, the sound is maybe even cooler – thanks to work from the London Philharmonic. Group leader/singer/keyboardist Roy Phillips composed the whole thing, and the Peddlers are at the core – but they're also helped out by percussionist John Punter and guitarist Toney Walmsley, and Peter Robinson – who did the larger orchestrations. Titles include "This Strange Affair", "Raining In London", "Sequence Of Thought", "Did She", "Sequence Of Thought", "In Juxtaposition", "Under London Nights", "River Lives", "I Have Seen", "Impressions", and "A Year And A Day Metamorphosis". 2LP set features a rare bonus album – with tracks from singles that include "Nothing Sacred", "Manah", "Sing Me An Old Song", "Have You Ever Been To Georgia", and "Back Alley Jane". © 1996-2019, Dusty Groove, Inc.